> Key Private Bank > Active vs. passive investing. Is your strategy the right approach? When it comes to building portfolios for wealth creation, Key Private Bank experts believe our clients are best served by a disciplined approach that incorporates both active and passive strategies. We understand the debate over which methodology generates better outcomes has been going on for decades, but with the right team by your side you’ll reap the benefits of a method that’s time-tested. 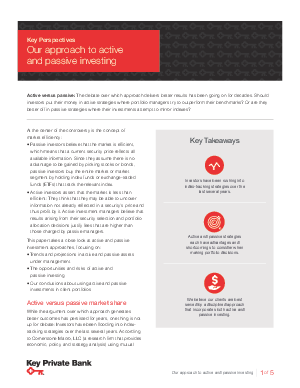 Learn the whys and hows of both passive and active investing, and what to do to maximize their benefits, your portfolio and wealth when you read our latest whitepaper.